More and more pet owners are learning the joy of keeping bunnies indoors and realising that actually bunnies can be easily trained. You can, with a little patience, teach bunnies to use litter trays, to clicker train them and even go onto something a little more advanced such as agility or showjumping! As well as our simple guide, one thing that crops up a lot from our customers is their toileting behavior and litter training. So we have come up with our top tips to consider when keeping rabbits as pets and some top tips on litter training too! Rabbits have a life expectancy of up to 12 years which means they’re a long-term commitment both in terms of time and money. Over a lifetime, rabbits will need a great deal of veterinary care; they should be neutered to prevent problems and need to be vaccinated annually. Rabbits are social animals that thrive in company and in the wild they live in large groups called colonies. So, they can get very depressed if living a solitary life; for this reason we sell our rabbits in pairs to ensure a happier life with companionship. If you don’t have a bonded pair, introducing your rabbit to another can be a long and difficult process which needs supervision, but it is well worth the effort. If your rabbits are living outdoors, they need space beyond the hutch to run, play and mimic ‘wild’ behaviour. A hutch is not enough. When housing bunnies outside you need to provide as much space as possible, that is protected from predators and is sufficiently weather-proofed against extreme heat and cold. House bunnies will benefit from greater daily attention and can live in cages, but they still need space to exercise which means you’ll have to bunny-proof your house. There are several options to house rabbits inside. They can live free-reign in a bunny proofed room/rooms, or they can be contained within a pen or large enclosure. If contained, their space should always be large enough so they can hop around, sit up and stand comfortably, and they should be let out of their pen for at least a few hours everyday for exercise. Rabbits need space to run around and explore. In order to create a safe space for your bunny and to protect your belongings, you will need to thoroughly bunny proof the area – rabbits LOVE to chew! A rabbit’s diet should mainly consist of hay. Fresh hay should be provided to rabbits at all times. Hay should be good quality and dust free. Using a feeder can be helpful because it keeps large amounts of hay dry, clean, and accessible for your furry friends. It can also provide enrichment – popping small treats and vegetables in with the hay can encourage natural foraging behaviours and help keep them busy. Rabbits have hypsodont teeth which means they grow continuously. Providing good quality hay at all times can help them wear their teeth down naturally and keep their digestive system healthy. Supplement your rabbit’s hay with fresh vegetables, fibre-rich pellets and fresh water daily. A good quality pellet food gives your bunny all the vitamins and minerals he needs to stay fit and healthy. Be sure not to over feed (an egg cup of pellets is usually plenty) as they may prefer to eat these rather than their hay – hay is the most important part of their diet! Rabbits can get bored very easily. Not only do they need space to exercise, they also need mental stimulation. Cardboard boxes and tunnels are great because rabbits spend hours chewing new windows and doorways. There are also lots of tunnels and toys available that are rabbit friendly and super fun for them to play with. Try and get creative and give your bunnies something new and interesting to gnaw, dig in and play with regularly to stop them becoming bored and grumpy. Rabbits are naturally clean animals and wash themselves frequently. But you still need to groom your rabbit on a regular basis. Rabbits like many animal’s moult regularly so it’s important to brush your rabbit to remove all loose and shed excess fur on at least a weekly basis. Rabbits can suffer from hairballs, just like cats can, due to their self-grooming habits. However, unlike cats, they cannot vomit ingested hair and expel it. So, it is super important groom regularly, remove excess shed fur and give plenty of hay and water to help reduce the build of hair in their digestive system. Regular nail clipping is also important because they grow continuously and need looking after to ensure they don’t become too long cause discomfort. How do you start litter training your bunny? Litter training is actually a very natural process for a bunny to learn as they are naturally very clean and hygienic animals. Here we have some simple steps to get you started, but do be prepared for some bunnies to take a little while to get the hang of it. Start small and go at your bunnies own pace and with a little patience most bunnies get the hang of it. First things first – bunnies need their own space and territory. Before you begin the process of litter training your house rabbit/s with the end goal of free roaming your home (which is an amazing way for your bunny to live!) it is important for them to learn where their core base territory is and that it belongs to them. So give them time to settle into their indoor enclosure and to comfortably use their litter tray in their enclosure with confidence. If they prefer a certain area or corner of their enclosure, try moving the litter tray there to work with their preferences. Praise your bunnies each time you see them toilet in their litter tray with something they like such as a small piece of their favourite veg or treats. This will give them a positive association with using their tray to do their toileting business. Once your bunnies are confidently and happily using their trays, open up their enclosure so that they have access to a wider space. This will allow them to come and go from the ‘bedroom and ensuite’ to more space for play time. Keeping this to one room or pen area for the moment will help prompt your bunnies to go back to their litter tray in their enclosure when nature calls. When you see them heading to a corner that doesn’t have litter tray, lifting their tail and looking like they may toilet in the wrong place, coax them back to their enclosure with their favorite treat/veg. Repeating this step will build bunnies thought process to think ‘litter tray’ when the need to toilet comes. Accidents may happen but don’t despair, simply pick up any poops and put them in the tray. By doing this you will reinforce where their toilet is. You should never tell a rabbit off for having an accident as this can make them fearful and easily scare them. Once your bunnies have gotten into the habit of going back to their ‘bedroom and ensuite’ to toilet in this first room or pen area – open it up. If the intention is to allow them free roaming access to the whole house, slowly open it up to them room by room and provide a litter tray with a little soiled substrate and hay inside in each room for them so that they always have somewhere safe to toilet in case they can’t make it back to their enclosure. As they become more and more confident in roaming the home they will need less litter tray access so they can slowly over time be removed if you wish. But be prepared to put them back down if accidents occur the first time you remove them. For some bunnies it can take a little longer to learn they have to go all the way back to their enclosure if they are in another room of the house. If you have aced litter training with your bunnies why not use our guide on clicker training pets. Rabbits are naturally very intelligent animals that often find great enjoyment in learning and being rewarded for their actions by their owners. 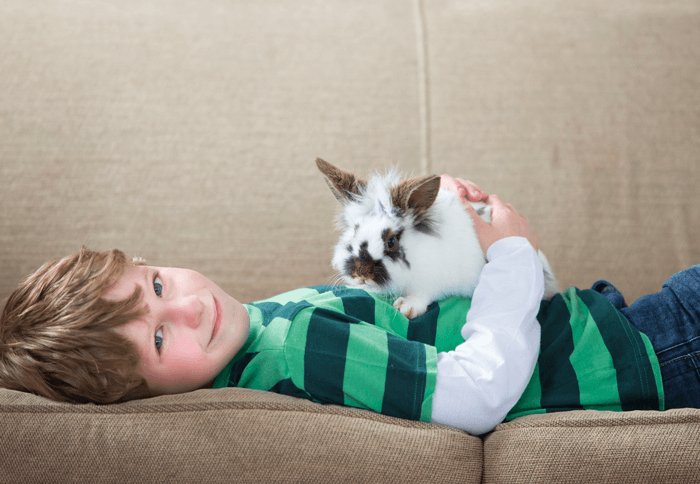 Teaching your rabbits using a clicker training method can also be wonderful way to build a bond for life between you and your bunnies. And why stop there? Did you know bunnies can also be trained to do rabbit agility and even showjumping? With training bunnies, the sky is the limit!